Cosplay. Montreal Comiccon. Photo Jean Frederic Vachon. 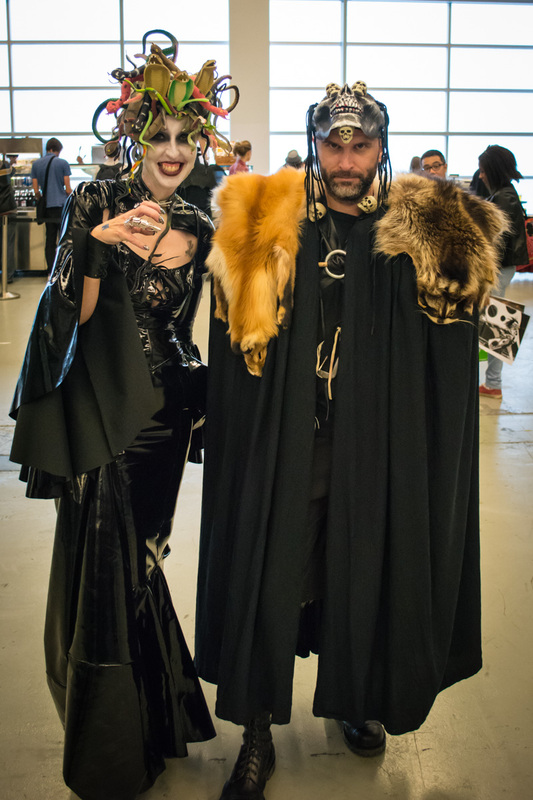 The 2014 Montreal Comiccon took place over 3 days (September 12-14) at the Palais des Congrès, with guests from various areas of fandom, from cult movies and shows to comics to wrestling, along with a wide range of cosplayers both pro and amateur. Organizers expected more than 40,000 people to show up to the event. 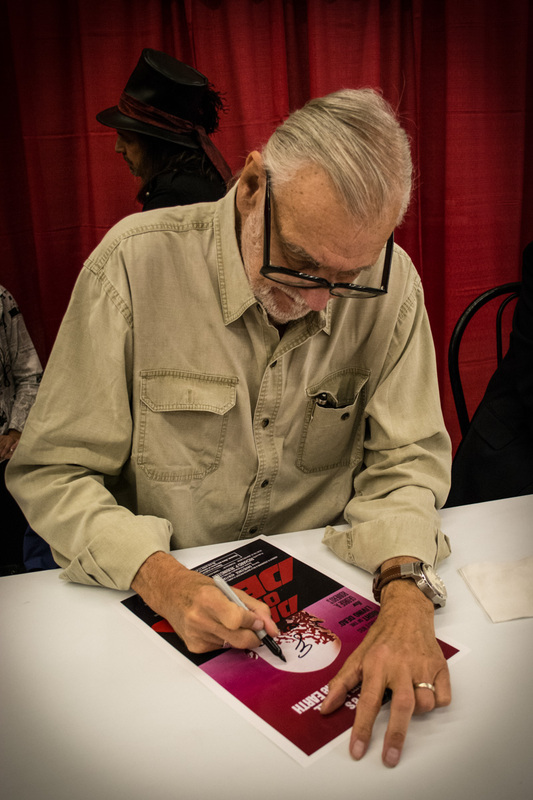 George A. Romero. Montreal comiccon. Photo Jean Frederic Vachon. Guests of honour included the cast of Star Trek: The Next Generation, as well as former pro wrestler and sometime “actor” Hulk Hogan, horror icons Robert Englund and George A. Romero, Arrow’s Stephen Amell and Carl “Apollo Creed” Weathers. All the guests signed autographs and had photo ops available for fans, as well as participated in various Q and A sessions, panel or special presentations. Many fans were mightily disappointed by the last minute cancellation of Doctor Who’s Matt Smith (and judging from the number of Fez and bow ties, he had a lot of fans in attendance), but you’d be hard pressed to criticize the guest list. 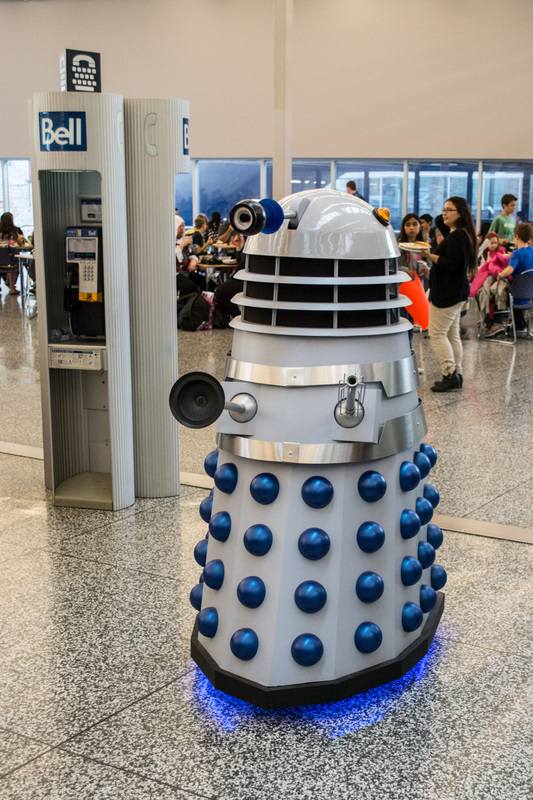 Dalek with the wrong phone booth. Photo Jean Frederic Vachon. Montreal Comiccon. Doctor Who canvas in progress. Photo Jean Frederic Vachon. The exhibition hall had a section devoted to comics, with a large contingent of local artists present. An important part of the hall was for merchants, selling memorabilia ranging from comics to costume to clothing to all sort of accessories. Business seemed brisk despite being mostly cash only (and most of the strategically placed ATMs showed error messages while I was there). It must be said that Comiccon is a fantastically efficient way of parting you from your cash, as everything has a price, from photo ops to autographs to sketches. Bring loads! Lego Batman. Photo Jean Frederic Vachon. 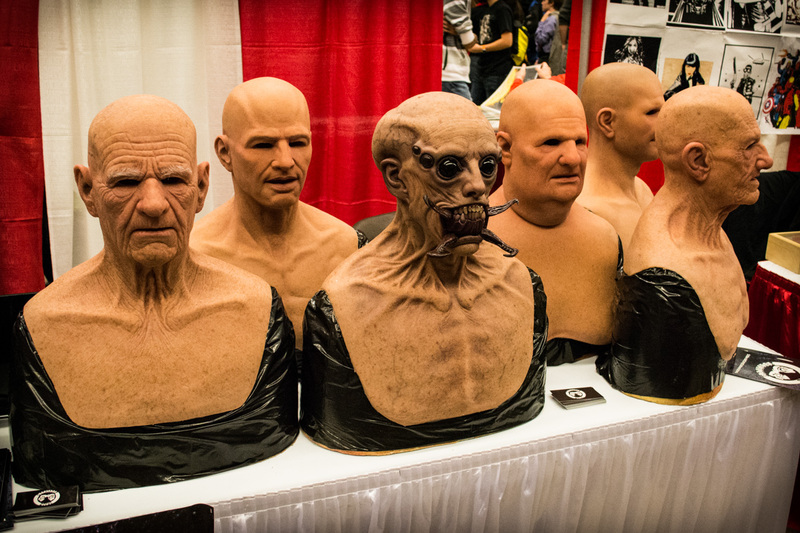 Masks from Real Flesh Masks. Montreal Comiccon. Photo Jean Frederic Vachon. Only two exhibitors stood out from the sea of geekness on display. An insurance broker from Industrielle Alliance had a booth there. “Hey bro, I went to Comiccon, got my picture taken with Norman Reedus from Walking Dead and got a sweet deal on a life insurance policy” is probably not something anyone heard. And the Canadian Armed Forces also had a booth (or was that awesome cosplay?) which seemed a little out of place too. 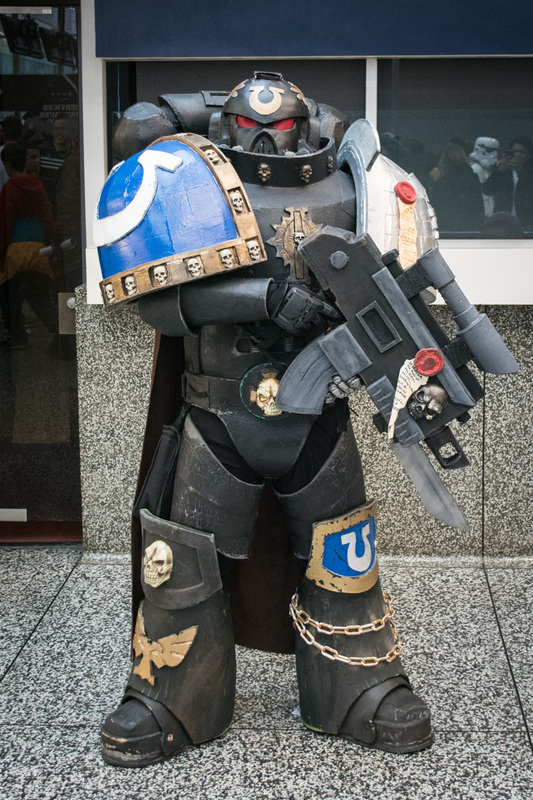 Warhammer 40K.. Montreal Comiccon. Photo Jean Frederic Vachon. Various Q&A and special events took place all over the building during the course of the weekend, with crowds lining up long in advance for a chance to attend. As the guests are usually booked around a few themes (Star Trek, Power Rangers, Nightmare on Elm Street), it allows the organizers to create interesting content. 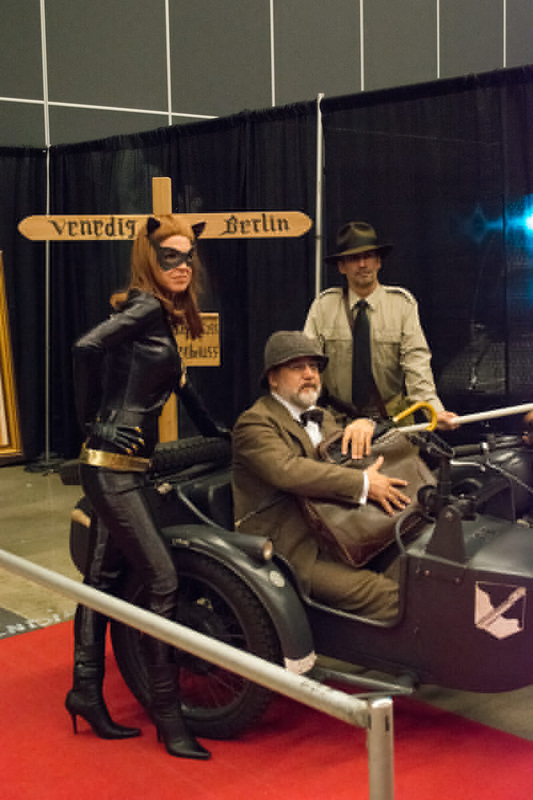 Catwoman and Indiana Jones. Montreal Comiccon. Photo Jean Frederic Vachon. And of course there was a lot of costumed people. From shoddily thrown together affairs to elaborate efforts that must have taken weeks if not months to assemble, creativity was on display everywhere you looked, from people young and old. One of the pleasures of walking around Comiccon is admiring the costumes and marvelling at the effort put in (luckily, Halloween is just around the corner so the costumes can serve again). Truly, Comiccon is an event of the people just as much as it is of the exhibitors and guests. Zombies. 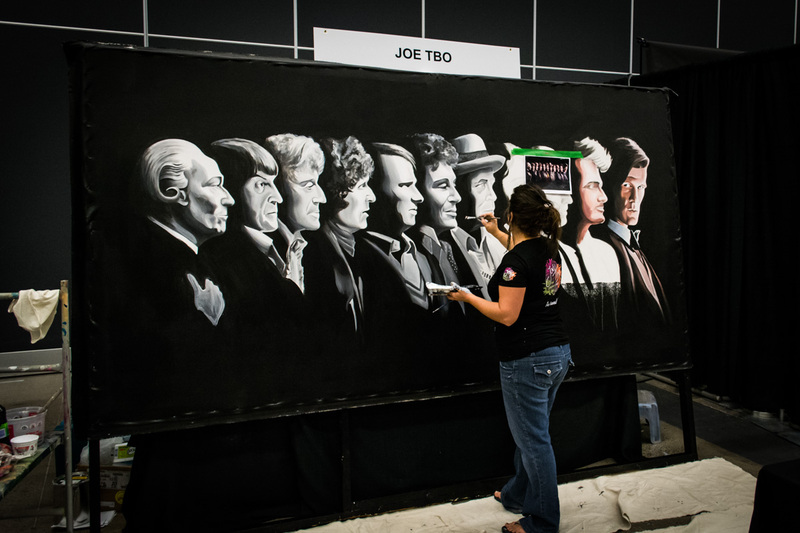 Montreal Comiccon. Photo Jean Frederic Vachon. 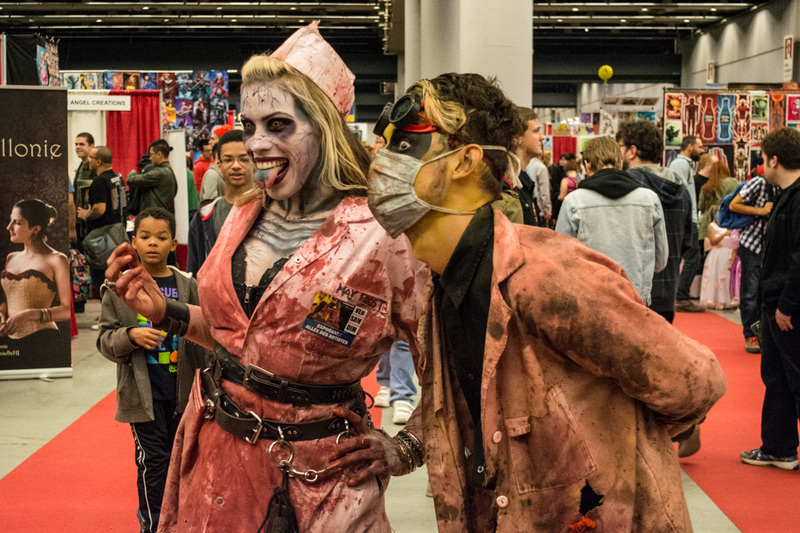 The Montreal Comiccon has grown a lot since its inception in 2006, and rumour has it that it will be even bigger next year and take over the whole of Palais des Congrès (The event will also move to July). Montreal can be proud of its premiere fandom event, an event that is not afraid to showcase its local talent and appeal to both the anglophone and francophone segments. Let’s start saving for next year already. 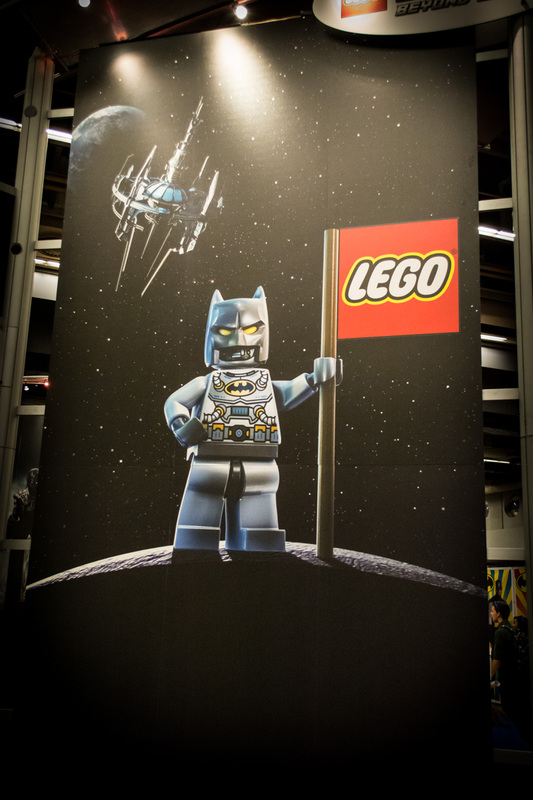 Comiccon took place on September 12-14. Jean Frederic Vachon has an amazing blog on music called Diary of a Music Addict. Check it out for more of his writing.